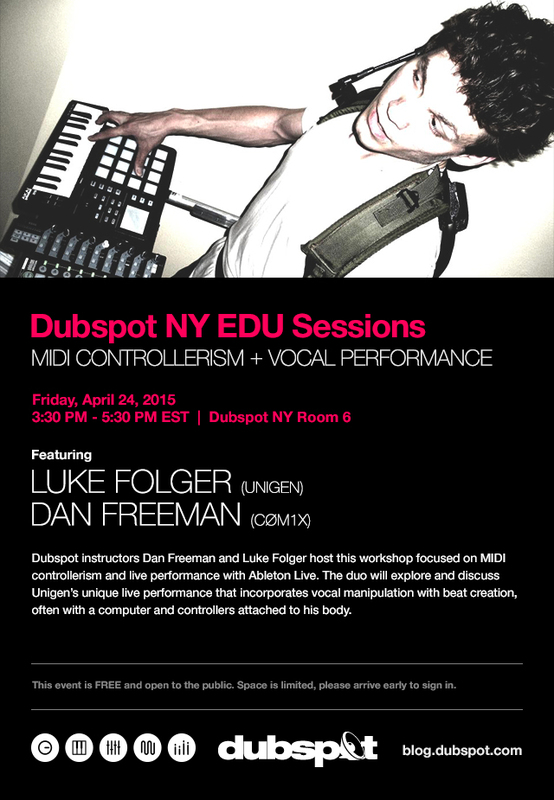 On Friday April 24th, join Dubspot Instructors Dan Freeman and Luke Folger for a free NY EDU Sessions workshop on MIDI controllerism and live vocal performance with Ableton Live. Join Dubspot Instructors Dan Freeman and Luke Folger for a free workshop focusing on MIDI controllerism and live performance with Ableton Live. The duo will explore and discuss Unigen’s unique live performance that incorporates vocal manipulation with beat creation, often with a computer and controllers attached to his body. Luke Folger’s musical foundations began early on, in Washington State, growing up in a house full of hand drums and experimental percussion instruments which his parents constructed and played. While studying studio art in college, Luke began exploring MIDI controllers and live performance of his compositions, while playing drum set in progressive rock and emo bands. Soon after moving to NYC in 2007, Ableton Live opened up his world as a dynamic electronic instrument, and it would soon power his one-man band, Unigen. Driven by a desire to deliver a performance closer to the body and further from the laptop, Luke built a jet-pack style mobile suit and began performing original songs in the subway system, singing with a headset mic and executing samples and sequences with his hands. Unigen has continually streamlined and evolved, and some wildly innovative solutions for expressive playing in Ableton have put Luke on the cutting edge of live electronic music.